Ultimate Purity Shampoo from the Keratin Therapy range. 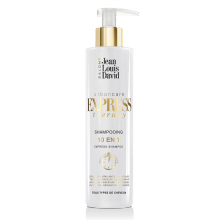 Let’s take a closer look at this softening, sulphate-free shampoo that has been designed to deeply hydrate and nourish damaged hair. Ultimate Purity is great for strengthening your locks as it is enriched with keratin, one of the most important ingredients for keeping hair healthy (this protein makes up 95% of the hair’s fibers). It also prepares the hair for any products that are to follow, such as styling products. Use between two and three times per week, massaging gently into damp hair to create a rich lather, then rinse thoroughly. Repair and Shine mask from the Oil Therapy range. This mask is perfect for intensely regenerating your hair. Made up of a combination of vegetable oils with restoring, thickening and softening properties (including jojoba, argan and date oil), it hydrates without weighing down your style. Use after shampoo on hair that has been wrung out in the shower, then allow to work its magic for five or so minutes before rinsing. Hair appears shiny and reinvigorated immediately after use. Dual phase Soft and Shine from the Hydra Therapy range. Another great option for perking up damaged hair (even the driest of types) and restoring it back to full health. Soft and Shine will save you time in the morning thanks to its spray nozzle and leave-in formula, meaning you can spray and go. Its double action means that hair is softened, to facilitate detangling as well as hydrating hair over a longer period of time.